The decision to re-pot succulents should not be as daunting as you think. If it doesn't look as healthy as it once did, or it doesn't seem to be to actively growing, then it may be the time to re-pot. They will LOVE you for it. All that extra nutrition and aeration around their roots will get them on the right track to producing some amazing new foliage. Remove any dead leaves and/or give your succulent a light pruning. To get your succulent out of the pot - Tip it upside down, place your hand under the plant and tap the edge of the pot onto a hard surface until it simply pops out. Try not to pull it out, there is no need, it will come out after a few taps. Give the roots a light pruning as well - this will encourage new root growth. Place into your new pot a good quality, well draining cacti and succulent potting mix. You want enough in there so when you place your succulent, the base of the plant is level to just under the top of the pot. Fill in the gaps with your potting mix, being sure to not press down the mix. This will only compress the soil in the pot and reduce their root growth. Simply tap the pot on the ground instead to get the mix into all the nooks and crannies. Fertilise with a control release fertiliser. Are they water repellent? Watering sparingly over the winter period is great for succulents, but it may have dried out the potting mix they are in and made it water repellent. Does the water just sit on top? If this is the case, you can use a soil wetting agent. They usually come in liquid form and are available at all independent nurseries. Pruning - A light pruning will encourage new growth and create a more compact plant. 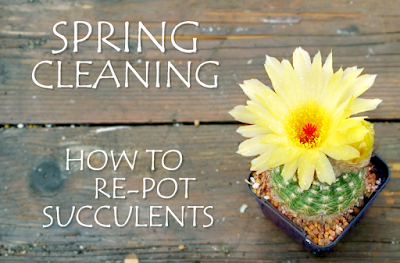 With your rosette succulents, simply remove the dead under leaves. Fertilise - You can use a combination of seaweed solution and a blood and blone liquid fertiliser to give your succulents a real boost. Now is also a great time to reapply a control release fertiliser. With just a little bit of effort, your succulents will have the best chance during this peak growing season, and you will be rewarded with lush new growth and maybe even some spectacular flowers. Happy Gardening! 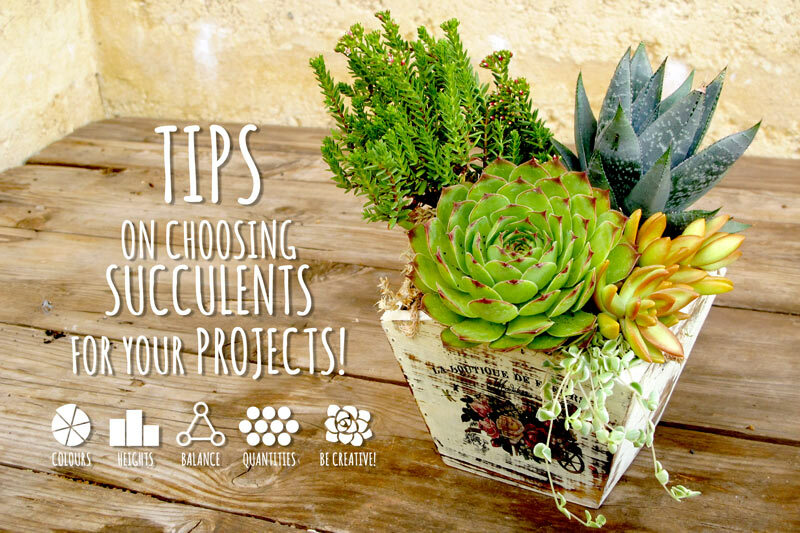 TIPS on choosing Succulents for your Projects! Consider different colour combinations that work with the colour of your container - Contrasting colours offer a vibrant look, where analogous colours are more natural and harmonious. Combining different heights will give you a fantastic dynamic look. Place tall succulents in the centre of your design as a focal point, then small trailing succulents around the edges. Fill in the gaps with medium sized succulents. The effect will be a balanced look that is pleasing to the eye. Use an odd number of multiples for particular species - It will balance out your design. Place multiples in a triangular pattern so that they are equally spaced apart. Don't be afraid to pack many succulents into a small space. Succulents are more than happy to coexist with each other in tight places. Plus it will help to make your arrangement look more compact and lush. Your imagination is your only limit! Scrounge around your home, back shed, local op-shop or salvage yard - You would be amazed at what spectacular artworks you can make out of the most unlikely of objects! 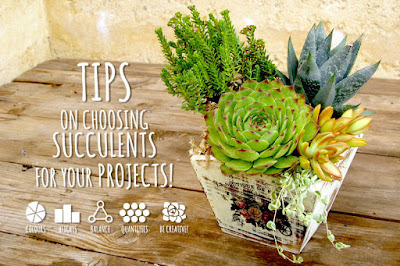 For more information on project tips, as well as instructions on how to make the Succulent Box pictured, head over to the Succulent ART website. In the Garden: Make sure your succulents are getting enough light. Remember, Winter has far less daylight hours than the rest of the year, and overlying tree branches can reduce the amount of light your garden receives. Try to prune these tree branches back as much as you can to increase the amount of light. In Pots: If possible, relocate your potted succulents to a position where they can receive a significant amount of light over Winter. In the Garden: Check that your soil is free draining. This is so important. I cannot stress this enough. With all the rain that will be soaking the soil over Winter, it is important that the majority of it can freely run away from the immediate area. To help improve the drainage of clay like soils, add Gypsum, a product that helps break down and loosen clay. Simply follow the instructions on the packaging to add it to the soil. Mix it through your soil and water in thoroughly. In Pots: Check that your potting mix hasn't collapsed. Collapsed potting mix can create a perched water table at the bottom of the pot, and this causes the water to not be able to drain. If this is the case, remove the lower collapsed potting mix and replace with new fresh cactus and succulent potting mix. Place feet under the pot so that the water can freely drain. In the Garden: Avoid pruning through the Winter months. This creates a wound on the plant, where infections can set in and rot your succulents. In Pots: This rule applies to potted succulents too. In the Garden: Mulch the garden bed to keep the soil warm. This will protect the surface roots from the cold and frosts. Be sure to keep the mulch away from the base of your succulent, as this can cause rot. Place large rocks and masonry statues next to your succulent to help radiate heat and keep the temperature immediately around your plants warm. This is great in frost areas. In Pots: Protect cold sensitive plants like Sanseveria and any tropical succulents by placing them under cover. Cacti should also be under cover for the Winter period. Add a layer of stones or pebbles to your pots to help keep the soil warm. In the Garden: Turn off your reticulation. A silly point to mention, but it is easy to forget to disable automated systems over Winter. Not to mention you risk getting a $100 fine from the Water Corporation if you use your sprinklers from the 1st June to the 31st August and are located in either Perth, Mandurah or some parts of South West WA. In Pots: Reduce watering your succulents over Winter as the water evaporation rate of the soil reduces significantly during this period. You can tell if your succulents will need watering by burying your finger in the soil. If it is dry, water it. 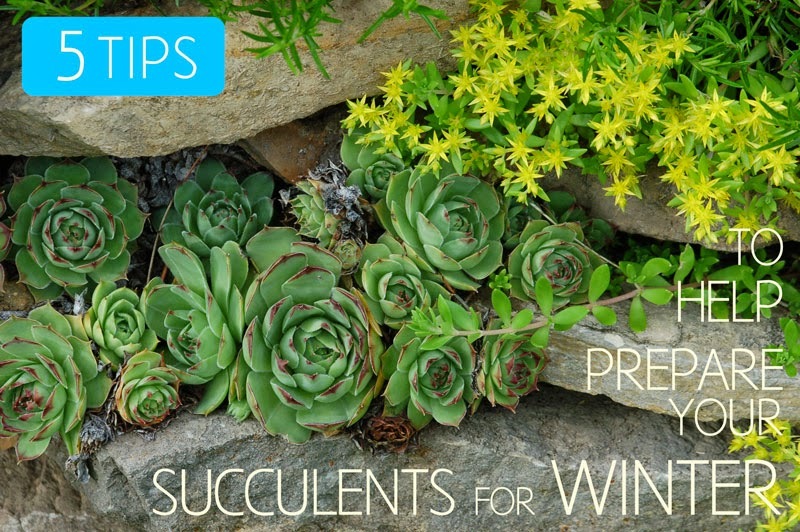 Hopefully these tips will help prepare your succulents for the cold and rainy season, and keep them looking great for the next few months to come. Mealybug is a sap sucking insect that can rapidly spread throughout a succulent collection and cause very ill plants. Tiny cotton threads can be seen on the foliage. They usually hide in tiny crevices and reproduce rather quickly. Many people use methylated spirits on a cotton bud or white oil to remove them however once they are there it is very difficult to remove entirely. These little guys don't stop at the foliage. They can also infest your roots. 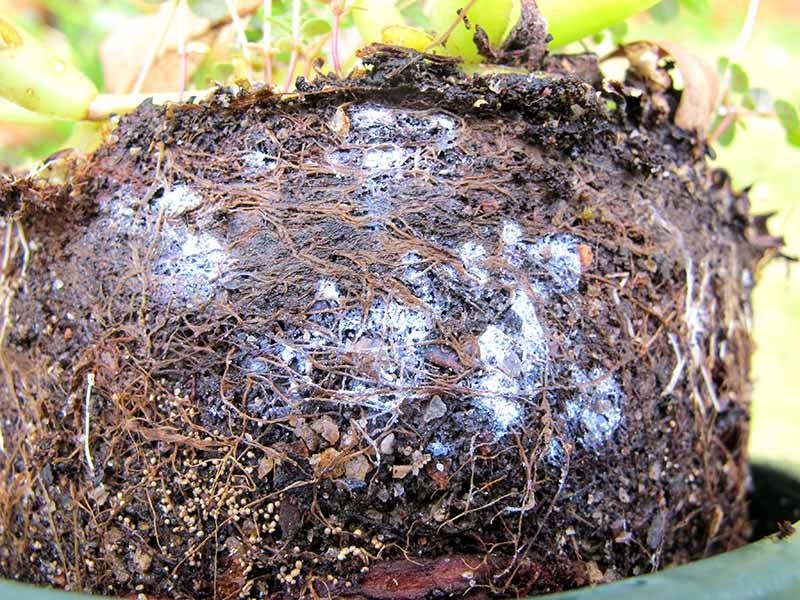 Root Mealybug spreads like wild fire once it gets hold in your pots. And unfortunately you don't know it is there because it is on the roots of your plant. Tip your plant over and take the pot off. They look like white cotton throughout the potting medium. Eventually they can kill your plant and can easily spread to all of your collection. If you see Ants hanging around your pots there is a good chance that there are Mealybug or some other sap sucking insect like scale attacking your plant. Most sap sucking insects including Mealybug, excrete a sticky residue, and this is what the ants are attracted to. Contrary to popular belief, removing the ant problem is not going to get rid of the Mealybug. Get rid of the Mealybug and the ants will disappear for they will not have anything to feed apon. How do I keep Mealybug away from my collection? Avoid using second hand pots. Mealybug can be transferred from the pot to the plant. Never use second hand potting mix. If you find they are infested on the roots throughout your plant, take cuttings (as long as the foliage is free of them) and throw your plant in the rubbish. If the Mealybug is on the foliage, isolate the plant from your other plants and apply a systemic pesticide, alcohol spray or soapy emulsion. If they are seriously infested, throw the plant out. It is just not worth the risk. Apply the pesticide to your other succulents at the same time for a preventative measure. Good hygiene when handling your plants is very important. Also, keep your plants healthy with regular feeding, sufficient water, adequate light and excellent drainage. All this and the occasional application of a seaweed solution helps the plant defend itself against Mealybug by helping to build strong cell walls. If the insect can't penetrate the strong thick cell walls they can't feed. Healthy Plants are happy plants and are generally bug free!